In order for your home to have the beautiful, elegant look that a hardwood floor brings to it, you have to ensure that you install your floor properly. That entails properly preparing and laying down your floor boards. In this article, we want to show you how to approach the first phase in the installation of the hardwood floor, which is the preparation process. 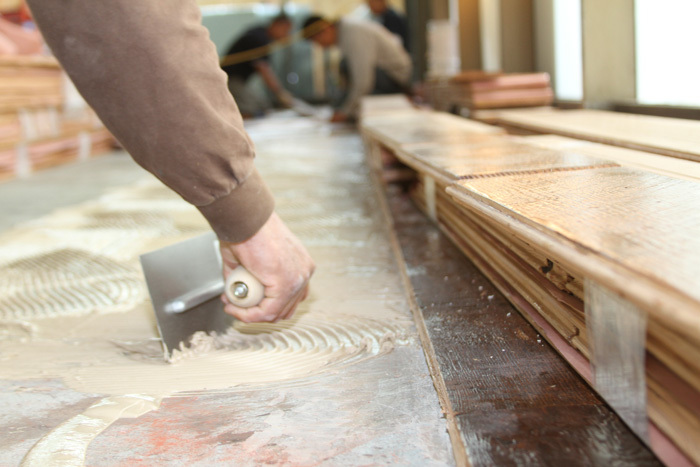 Once you do it right, you can get the best benefits and value from your wooden floor. In this preparation process, you will need to ensure that the floor is clean, smooth, dry, leveled and structurally sound. You will have the option of laying the new hardwood on the existing floorboards if they are in good condition or you can lay them on a concrete base or a new plywood sub base. When preparing the room for the layout of the floorboards, you need to remove doors, skirting’s, floor trims or mouldings, so that you can properly lay down the boards right up the room’s edges, while still leaving a gap for expansion. Also, ensure that you allow the wood to adjust within the temperature and humidity of the area you want to install it. You’ll need to get a good quality underlay across the entire area if you will be floating your hardwood floor. Another very important aspect of proper preparation includes accurate measurements. That means that you will have to ensure that you measure the room accurately and establish exactly where the floor joists run. Remember that you should lay your floor vertical to them and find the longest straight wall, so that it can serve as a guideline for the alignment of your hardwood floor.